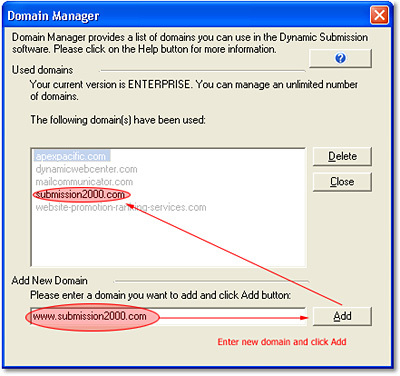 Domain Manager provides a list of domains you can use in the Dynamic Submission software. You need to set up the domains you would like to use in the program before hand. 1. Click "File" menu item from the pull down menu. For different Editions, the number of domains you can submit is different. The Standard Edition support 5 domains only. The Professional Edition supports 10 domains while Enterprise Edition can submit unlimited number of domains.